F This Movie Fest III is just a few days away! 1985 was a fantastic year for movies and there are dozens of films that I could go on and on about, but I chose to write about a western that’s become largely unsung and increasingly obscure. There is no other film quite like Silverado. Silverado, Lawrence Kasdan’s homage to the classic western film of yesteryear, opened the week after Back to the Future on June 10th, 1985, and isn’t usually at the forefront of people’s minds when discussing the great movies from that year. With competition like that at the box office, it never stood a chance. A lot of movie fans have seen it but don’t remember it very well. I’m guilty of this as well. I watched it years ago and thought it was enjoyable, then proceeded to forget about it. Revisiting it has been a revelation. The film was written by Lawrence Kasdan and his brother Mark Kasdan (who only contributed to one other screenplay, 1989’s Criminal Law). Kasdan’s pedigree speaks for itself. In 1978, Kasdan had sold the script for Continental Divide (which would eventually star John Belushi) to Steven Spielberg. Spielberg’s pal George Lucas wasn’t happy with the screenplay that Leigh Brackett had written for Empire Strikes Back, so Spielberg told George to give Kasdan a shot. Lucas liked it so much that he almost immediately had Kasdan write the screenplay for Raiders of the Lost Ark, and then, later, Return of the Jedi. Within just a few years, Kasdan had gone from no sold scripts at all to writing some of the biggest blockbusters of the day. For several years, the man was on a run that most writers dream about. Silverado appears just two years after Return of the Jedi and Kasdan’s own film The Big Chill, which was a major critical success and seems to have opened the door for his more expensive western. I don’t think that Silverado could have been made at any other time and was a product of the perfect storm. A few years earlier and I don’t think Kasdan would have gotten studio approval for the scope of his western. A few years later would have been too far away from his earlier success. Likewise, the casting of Silverado is perfect, and captures many of its stars at just the right moment in their careers. Kevin Kline is as much of a lead as this ensemble film can allow, and has just the right amount of affability mixed with danger and was a hot commodity following The Big Chill. Scott Glenn, who had come off Urban Cowboy and The Right Stuff, is perfect in the role of a sun-hardened wanderer. A few years later and he’d have settled into more conventional roles in films like The Hunt for Red October and Silence of the Lambs. A pre-Lethal Weapon Danny Glover shines as a man looking for justice and equality in a world where both are hard to find. And there’s an entire host of character and stage actors that populate the rest of the film: Jeff Goldblum, Rosanna Arquette, Brian Dennehy, Jeff Fahey, the film debut of Richard Jenkins and even John Cleese, who is allowed to deliver one of his old Monty Python lines. The real star of Silverado is Kevin Costner. I’ve never seen him so alive and full of charisma, and this is from someone who loves Kevin Costner. Here he’s hyper and impetuous, but also an incredible shot with his two six guns. Supposedly Kasdan cast Costner as a peace offering after cutting him out of The Big Chill, and if that’s true then I’m glad he did. It’s one of my favorite Costner performances. I can’t think of another in which he exudes so much personality and energy. Silverado is a lot of different things. In many ways, it’s a traditional western: a disparate group of people who come from different backgrounds and circumstances unite to fight a common enemy. That’s a story that’s been told a hundred (or even thousand) times in westerns, and in every other genre, too. The more westerns you watch, the more you come to understand that there are really only a very limited number of stories that exist, but what sets them apart from each other are the different ways of approaching the material. But Silverado is also a stellar character drama. If this aspect of the film failed, the movie would fall apart. We’d have no investment in the characters themselves; it would be a fun romp, but largely forgettable. The Kasdan brothers have crafted an incredibly engaging script that digs deep into the humanity of each of their characters. Only one or two of the roles in the film exist on the surface. Kevin Kline, Scott Glenn, Danny Glover and even Jeff Goldblum (in a much smaller part) all get to flesh out their characters in ways most movies just aren’t interested. Kline’s character has a checkered past that we never really learn much about. He’s a man of regret trying to do the right thing and not repeat past mistakes. Scott Glenn is a wanderer who is bound by a code of honor. He’s constantly weighing the cost of his actions and the actions of those around him. Danny Glover may have the juiciest dramatic material as a black man in a world of white men, struggling to walk with dignity in a world that would allow him none. Rounding out the casting of Silverado is the landscape of New Mexico. Kasdan uses it so well that I’m naming it as one of the cast. This is one of the most gorgeous movies I’ve ever seen. Every shot feels like a postcard. You could hang frames of this movie in a gallery. This is established within the first moments of the film. It opens inside a small wooden shack. A gunfight erupts and sunlight enters through the bullet holes in the walls, one by one. Finally, the door to the shack opens and Scott Glenn steps out of the darkness of the building and into the wide open sky of New Mexico. I thought surely the cinematographer had come from old-era Hollywood and shot John Ford westerns, but that’s not the case. John Bailey hadn’t really worked on anything that would lend itself to such a scope, and hasn’t really since this movie, either. I mean, Groundhog Day and Cat People, but that’s not the same. 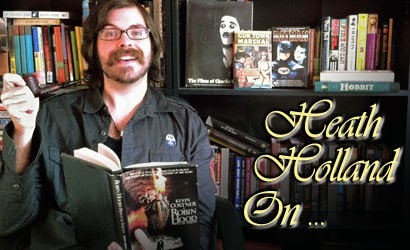 The final key to the film’s success is its sense of fun and adventure. Kasdan brings the same playfulness and wonder he did to Raiders of the Lost Ark and his Star Wars screenplays. This is a movie where Kevin Kline is allowed to have an internal crisis of morality and stand in the street in his underwear with a broken gun to face an outlaw charging him on a horse. It’s FUN. Many moments recall Indiana Jones facing that scimitar-wielding thug in the streets of Cairo. It’s very clichéd to say that Silverado feels like a love letter to the western genre, but that’s exactly what it is. Kasdan was clearly influenced by the big, sweeping Hollywood westerns of the 1950s and it feels like he’s paying homage to all of them here. That decade was the most successful period for the cinematic western, and also the most prolific era for great westerns on television. Most of the notable western TV shows got their start between 1955 and 1959: Wagon Train, Gunsmoke, Rawhide, Cheyenne, Have Gun - Will Travel and Bonanza all debuted during these few years. There are lots of little things and moments throughout Silverado that provide a tip-of-the-hat to the ‘50s. I’ve been watching a lot of Gunsmoke lately, and the entire final showdown of Silverado seems to be not only a visual homage to the opening titles of Gunsmoke but a straight up replication. Also referencing Gunsmoke: Marshall Dillon and his deputies frequently ate at Delmonico’s restaurant on the show; during the final fight of Silverado, there’s Delmonico’s, right in the middle of the action. I even thought that perhaps they filmed on some of the TV show’s old sets, but that isn’t the case. All this love for the influences of Silverado would technically make the movie a revisionist or postmodern western. I keep coming across that description in doing my research of the film, and I suppose that’s true. 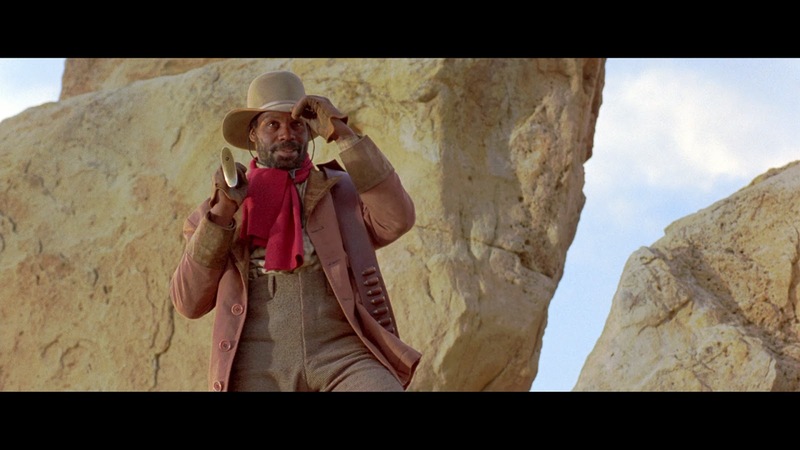 Danny Glover’s character would never have appeared in a classic Hollywood western of the 1950s, and there’s an awful lot of commentary on the hardships of the old west. It definitely comments on the genre and has a few things to say, but I feel like that’s secondary to the film’s number one mission, which is to tell a good, old fashioned western story. It isn’t just a postmodern western recapturing the past, but is also a successful traditional western in its own right. The more westerns you’ve watched, the more you’ll appreciate what Silverado does. I think that’s why I didn’t have quite as much respect for it the last time I viewed it. I’ve watched at least a hundred westerns since then (probably a lot more), and I can see now how cleanly Kasdan’s film achieves what so many others attempt. Earlier in this column, I wrote that there is no other film quite like Silverado, and I totally believe that. It’s the product of its influences but is influential itself. It’s postmodern, yet traditional. And in the nearly thirty years since this old fashioned, sweeping, family friendly western debuted, it’s become something else: one of the last westerns that Hollywood made using the classic style from the golden age. FANTASTIC piece, Heath; thank you, sir. This has been one of my very favorite Westerns since I was a teenager, and you nailed every reason why (except maybe the truly touching friendship between Kline and Hunt, who is wonderful: "If the world doesn't fit, make alterations. ")...it's just such a good time. Costner, as you said, has never had such unhinged joy onscreen before. Glenn has never been quite the hero he has been here, either, and I wish we'd gotten a chance to see him do so. I'll stop now because I could go on and on about pretty much the entire cast. Not to mention the eminently quotable dialogue or maybe the smile-plastering action beats (which are not, perhaps, on the level of a master like Walter Hill, but executed in perfect crowd pleasing fashion). Essentially, it's familiar and new at the same time. When I was a kid I loved it because it seemed kinda like every Western ever made all at once, like a greatest hits complilation, but assembled in a way I'd never seen before. And HILARIOUS in a way no other Western (aside from Butch and Sundance) ever had been, at least for my sensibilities. Well, now I want to thank you again for the post because I must watch it tonight; that's all there is to it. Between this comment and your piece, Heath, I can't wait to revisit SILVERADO. Thanks, Albert! You're right about the awesome friendship between Kline and Hunt. There's no sexuality to it, it's just a mutual respect among two people who see a kindred, rare spirit in the other. Good call. And yes, the humor is excellent as well. Silverado is indeed like every western ever made at all once, a greatest hits compilation. But for it to succeed at that is kind of amazing. Most movies have a hard enough time pulling off one or two things, but this one pulls off a whole bunch of different things, and succeeds at nearly all of them. While perhaps not a perfect film, it's made with confidence and purpose. Every western I watch proves how well Silverado succeeds at what it does. Completely agreed with Heath, Mike. Like he said, it's not "perfect" but at times you'd be hard-pressed to tell the difference. When something knows just what it is and exactly what it's trying to accomplish, and the result so clearly intends to entertain you right back into a child playing cowboy again, well, that's gotta count for something. I grew up in a family where visiting my grandparents and watching a movie meant which John Wayne do you want to watch. And don't get me wrong we all love John Wayne. And we love Silverado--it's exactly as you describe, homage to all big Westerns before it. I wish they still made a Westerns like this. Sniff.